Our LG G3 review is on the way, don’t worry, but as we put our final touches on it, we wanted to continue showing you all there is to see about this incredible phone. We gave you our 25+ tips and tricks for the LG G3 yesterday, ran through a series of features on Monday, and now have a better comparison of the device to the Samsung Galaxy S5 and the HTC One (M8) to show off. At this time, these are the three flagships of the moment. Sure, the new Moto X is still on the way, as is the Note 4, but for now, if you are considering a smartphone purchase, these are the three phones you would look at. Each carries top-of-the-line specs, though at least on paper, the G3 tops the other two. It has a Quad HD display compared to their full HD displays, 3GB RAM versus 2GB, and a 13MP camera with OIS+. The build is still plastic, but has been given a brushed metal coating that feels much better than the Galaxy S5’s dimples and is also not as slippery as the One (M8)’s real metal exterior. It packs the same processor as the Galaxy S5, uses a rear button placement for volume and power, utilizes unique software features, and isn’t all that much bigger than the other two even with its 5.5-inch front panel. With that said, there are a couple of things that could be downers for potential G3 owners. First, the display, even though it weighs in with a resolution of 2560×1440, is not as good as the Super AMOLED on the GS5 or the Super LCD 3 on the One (M8). That’s not to say that it is bad, it just isn’t as good in terms of color reproduction as the others. The UI tends to experience a stutter here and there as well, but so does the GS5. Overall, the G3 is the ultimate smartphone package, one that we can’t wait to tell you more about in our review. 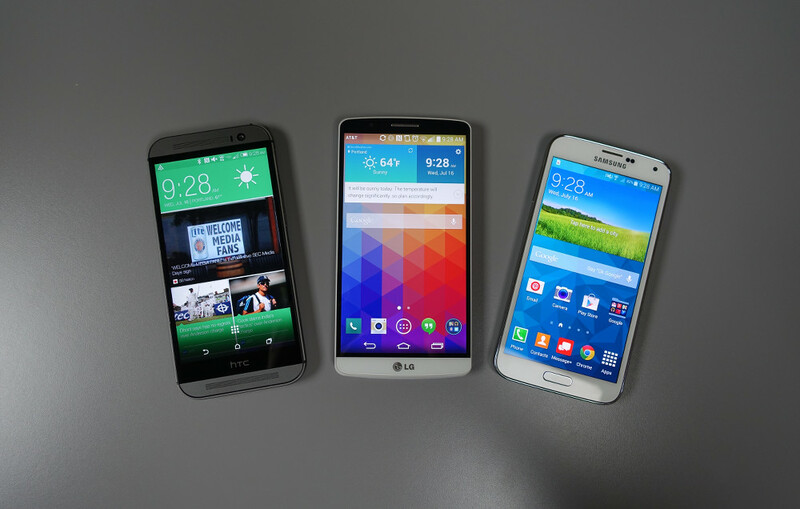 For now, check out the full comparison of Android’s three best phones of the moment.